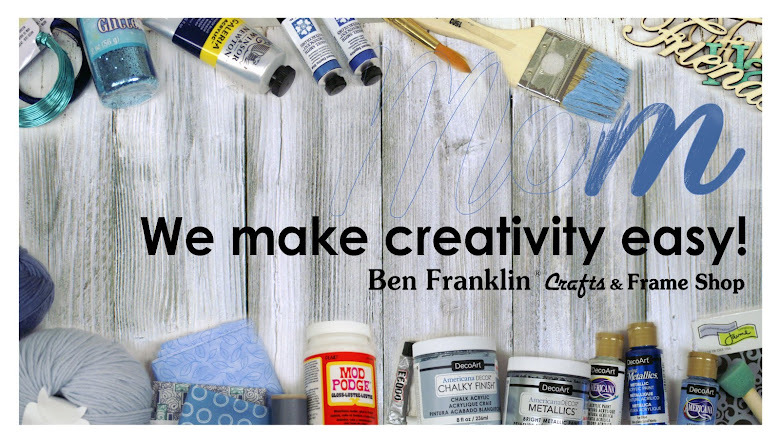 Ben Franklin Crafts and Frame Shop: Acrylic Paints: Which One Should I Use? With various acrylic paints available for crafting, you may wonder which acrylic paint should you be using. Well, it all depends on the type of surface you will be painting. From paper to glass to wood to metal, we break down the different types of acrylic paints to help you choose the best paint for your project. Great coverage and color, non-toxic, and dries in 15 minutes. 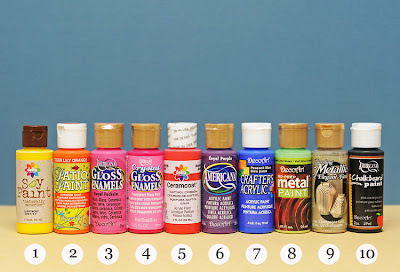 This non-toxic paint does not need sealing or varnishing and has a slight gloss when dried. After painting, do no expose to moisture for 72 hours. Before applying paint to glass or glazed surfaces, clean surface with alcohol. Air cure for 21 days or bake after drying 48 hours. NOTE: Any items you use this paint with is not for direct contact with food. Allow to air dry for 48 hours or bake in oven for 30 minutes at 200 °F in non-preheated oven. Allow project to cool with oven door open. Before applying paint, clean glass surface with hot, soapy water or rubbing alcohol. Paint has matte finish when dry. This non-toxic, water-based paint is a fast drying and permanent. Paint has matte finish when dry. Non-toxic and quick drying. Before painting, clean surface with vinegar and rinse with water. When dry, apply paint with brush or sponge. Allow 24 hours before exposing to moisture. Paint completely cures in 5 days. Apply two coats, one vertically and one horizontally. Dry one hour in between coats and let paint cure for 24 hours. I wish to use the clear chalkboard,paint to seal my reborn vinyl doll as it is sure to give a totally matt appearance any comments ? We are not sure how well that would work. You could test it out to see, but otherwise, you may want to use a matte sealer. We suggest using Montana Gold Acrylic Spray Paint. I want to make some gifts for family drawing on plates and cups from my kids.. What kind of paint can I use?? They will be eatting and drinking out of the cups and plates!!!! Thank u!! You would have to use paint or a sealant that is food safe. Any paint or sealant you use must indicate it is food safe before applying to any dishes, cups, etc. for consuming. Is there a sealant that you know of specifically that is food safe?? and possibly dishwasher safe as well? I have been asked to make large reproductions of some Dr. Seuss books for a children's reading. I am thinking of painting the large poster sized foam-boards. What would be the best paint to use? The problem I've had in the past using some acrylics is that I have to go over the same area multiple times to get that nice vibrant look. What paint would give me this look without having to coat several times? How long does the patio paint decoart brand take to dry between coats?